Every year, we go to BookExpo to check out any leads on water-sailing-boating books because good new entries are really hard to find. So many are repeats. "Cruise to Polynesia . 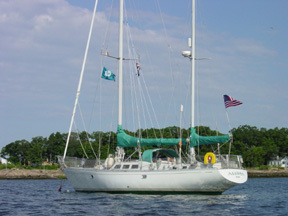 Learn to sail and bareboat charter in one week. My story of circumnavigating the world." I’m always on the lookout for the practical resources that “everyboater” can use in their own backharbors. That’s what CoastalBoating.net is about. At BookExpo this year we became pleasantly aware of enough new books to keep us posting reviews for the next six months or longer. 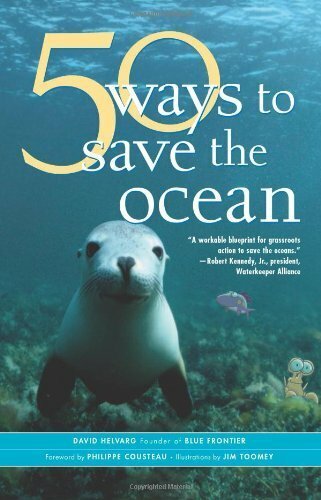 One of the books that most excited us was 50 ways to save the ocean. This is such a different take  a truly practical book in which each one of us can find some value - that we just had to review it right away. It’s also our second “two-fer”. Not only do we get to review a useful book, but we also raise awareness of the organization that’s helping to make things better on the oceans in our “Good Guys” focus on Blue Frontier. 50 Ways is organized into 5 sections: Enjoy, Conserve, Clean, Protect, and Learn & Share. The first section espouses the thought that we need to enjoy the ocean to appreciate its beauty and protect its integrity. It covers activities like walking on beaches, going blue boating, surfing, whale watching, and diving. It teaches responsible behavior, but unlike other resources, doesn’t place the blame on those who treasure interacting with the environment. The second section focuses on conservation of natural resources and organic, sustainable practices. Conserving water, using less fertilizer and pesticide, using less plastic and eating sustainable fish and foods are all things we can easily do. The third chapter identifies ways we can each help clean up our own ways from making our households “green” to sailing on ocean-friendly cruise ships. The fourth helps identify ways to protect the environment, from helping to monitor habitats to becoming active in conservation organizations. The final chapter teaches us how to learn more about our environments and then share what we learn with others. After all, awareness of the issues and the solutions is 9/10 of the equation. The book is written in a very simple style and friendly non-threatening tone. No one topic gets more than a couple of pages devoted to it so it doesn’t preach. It simply provides some stimulation to become part of the solution. The author, David Helvarg, is active on the speaking circuit. If you’d like to reach him or another member of the organization about speaking at your club or social group gathering, contact him at Helvarg@bluefront.org or 202-387-8030.